Many summers back we had an impromptu BBQ dinner with friends at our Taiwanese home. 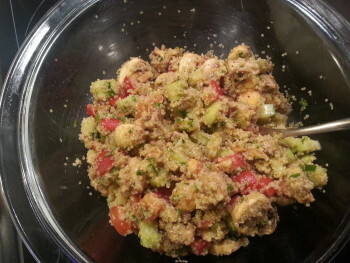 Our guests brought Pot Luck to our home, one of the dishes a fantastic Tabbouleh salad made with bulgur. My first attempts to remake Tabbouleh was disappointing since then I learned of my mistakes such as not squeezing hard enough to remove all liquid. While parsley is the main herb ingredient, you can easily make adaptations with other herb options. Based on this salad but creating a different taste is by adding 1 tablespoon of sun-dried tomato tapenade instead of tomato puree for a pronounced flavour. 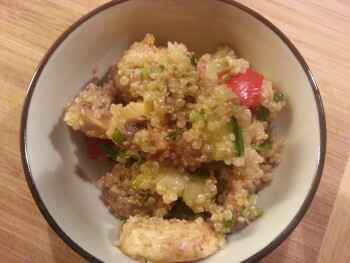 A healthy dish with memories, running out of bulgur gave room for another twist by preparing this salad with Quinoa seed. With every bite, the seeds will pop a little giving it an extra dimension. With no fresh lemons available nor bottles of lemon juice, I substituted with Chinese rice vinegar and adjust seasonings for the olive oil based dressing. The same reason I tried Apple vinegar which would be my last resort since it has a higher acidity you need less. So start with just one tablespoon and increase with half if needed. Last summer our youngest came back from her holiday in Morocco with student peers. She brought Aragan oil purchased from a local vendor in a small village. There’s a reason why it is called Moroccan liquid gold as one of the rarest oils in the world. The nutty taste and fragrance is absolute heaven! I am not an exaggerating type but Aragan oil really does give an extra dimension to salad dishes. If not available you can replace with walnut oil, olive oil will work but has a different end taste. Liquid gold, it is an unequalled and understandably rare commodity outside of Morocco. A food gem in my kitchen cabinet for as long as the treasured food gift last. 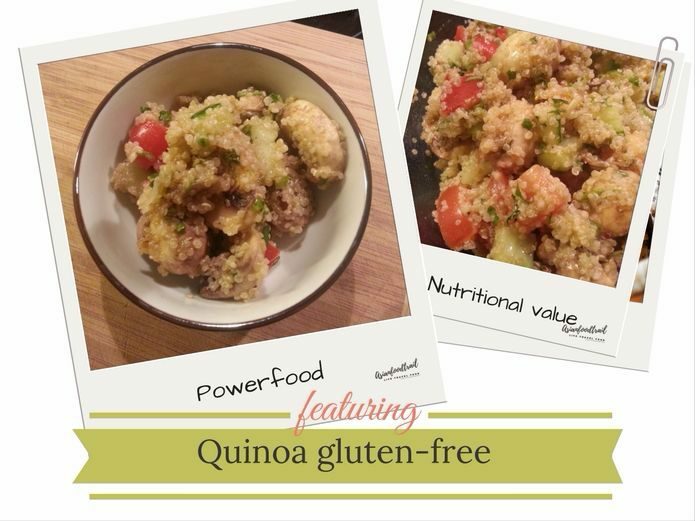 Quinoa is a basically a powerhouse full of nutritional value and a good choice on the menu. 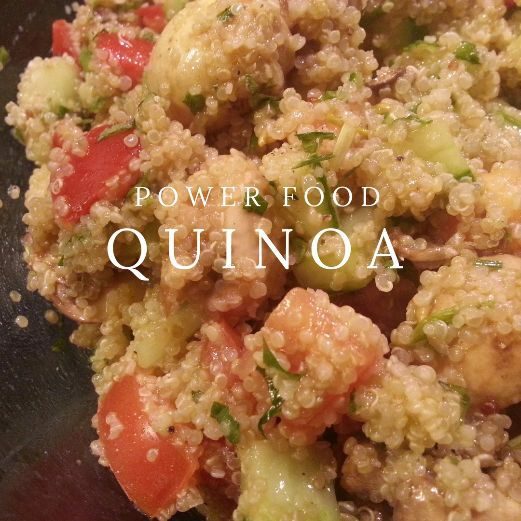 A super grain high in protein and fibre, an ancient seed re-ignited as a super food. If Aragan oil is gold liquid than the mother grain of the Inca’s are gold nuggets. 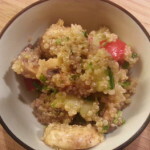 Apparently, NASA sent astronauts into space with Quinoa on the menu as the power food. Today’s Tabbouleh version has no parsley, instead, it is prepared with fresh mint and coriander. You can serve the dish for lunch with bread, dinner or barbeque as a side dish. For other salad inspiration, try our Red Beet Salad with Orange, Feta Cheese, Mint recipe or Yum Nua Thai Beef Salad recipe. Whats-for-dinner! The standard phrase coming home with the school bus in Taipei, our kids during their childhood years (14-12-8 and 6 yrs old). In random order but always the greeting came before they entered through the door, whether it was from school, sports or even now grown up and arriving from workplace or study. Pack of hungry wolves if they brought friends along to play or finish homework, most of the time I had (healthy) snacks at hand but if I was late or not yet home they ransacked the fridge. During our years living in Taipei, I prepared this fusion dish with what I had on hand in the fridge and cupboard for a quick meal. 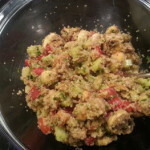 Which were chillies, cucumber, tomato, bell pepper, black olives, spring onion, coriander, lemon grass, galangal, lemon juice and chicken thighs (for e.g. try Chinese Chicken Wings in a soy-chili marinade). Noodles and Pasta, onion, garlic, staple items with various Asian seasoning’s which included fish sauce among many other flavourings. I just started whipping up this dish, it became an instant hit becoming a regular summer or barbeque meal side dish over the years. After our kids moved out for studies/work they called home for recipes; advice how-to instructions to prepare comfort food in their kitchens. Our kid’s cravings and questions are what initiated to write down recipes to share and celebrate good food with family, friends around the table. Writing down one recipe snowballed into more request even outside our inner-circle. From phone calls, e-mails, newsletters, social media came around combined with my geeky interest I landed here with a website blog, sharing my in- and outside kitchen adventures. This is one of our family favourite Thai Fusion Spaghetti, a Ching recipe fusing our European background with Asian flavours. These home-cooked dishes have a blend of ordinary and exotic ingredients, colourful with a mix of spices, fresh herbs prepared and enjoyed together. Start cooking put your teeth in it and share your comments. I have a food picture logged somewhere will add to the post, but please feel free to upload your result. Ching Thai Spaghetti recipe follows here below, enjoy!